On a recent morning in Dhunche, the gateway to the Langtang region, Red Cross aid workers heard a thundering noise. Heavy rains had been pouring over the devastated region, once a stop on a popular trekking route and a robust village, later obliterated by the first earthquake to ravage Nepal on May 25. Roxana Trigo Ballivián, of Colombian Red Cross, looked to the hills behind the field hospital where she was stationed to see a landslide rushing down, bringing rock and earth toward two mobile clinics attempting to work in the area. Cut off by the rubble filling the road, Nepal's mobile clinics were forced to return to their base camp, interrupting much-needed work. 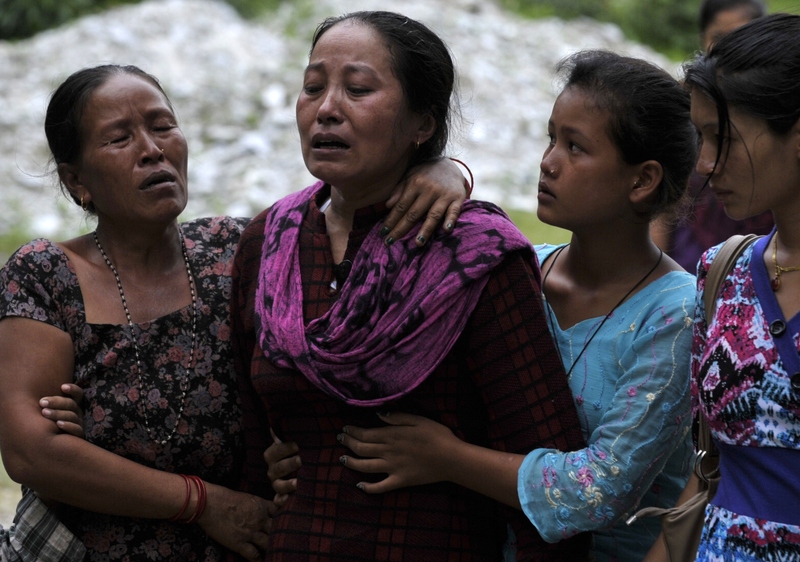 Landslides killed an estimated 21 people in early June and with monsoon season officially underway in Nepal, concerns are mounting for the nation still deep in the throws of rebuilding. Right now, 8.1 million people are in need of humanitarian support while 1.9 million require food assistance, according to the UN Office for the Coordination of Humanitarian Affairs. The 7.8 earthquake in May and it's 7.3 followup in April damaged 26 hospitals and over 1,100 health facilities, leaving millions vulnerable to the additional damages that will inevitably occur as the monsoon season carries on until early September. The water from heavy rainfall during a monsoon not only adds weight to soil, but reduces the friction between soil particles and the rock surface beneath the dirt, which can lead to a landslide. Because Nepal's hill slopes already destabilized from the earthquakes, they are at a greater risk for landslides now than in previous years. In 2014 a massive landslide cut through northern Nepal, the Sunkoshi River becoming a lake as the flow of water was cut off. It was a month before the Nepalese army was able to breach the dam made of accumulated mud. "The monsoon brings the real risk of further disasters in the form of landslides and flash floods," says Andy Chaggar, Chief Executive Officer of International Disaster Volunteers, to Bustle by email. "This can lead to further deaths, injuries and building damage. Longer-term reconstruction and rebuilding simply can't start during the monsoons and, even it it were possible, the rains and their impact means the situation is evolving all the time." Providing refuge before the torrential storms is one of the major priorities for organizations like International Disaster Volunteers. One of the initiatives currently underway by IDV is providing emergency materials such as tents, tarpaulins, and roofing tin along with the necessary fixings to allow families to establish temporary shelters. But as the rains increase, it will be harder to reach the communities that need aid. "I've recently returned from visiting Nepal, and some of the affected communities, so I can personally attest to how extreme the terrain is," says Chaggar. "Even where roads exist they are often unpaved and hard to navigate at the best of times. The monsoon makes this worse and many roads become completely impassible." Olga Murray, the founder of the Nepal Youth Foundation, attests to the trouble of providing aid during the monsoon season. The NYF has been involved in providing aid to Nepal for the past 25 years and is currently working on a multitude of projects including plans to establish community kitchens, open more children's homes, and continue to provide scholarships. But perhaps the most pressing need is providing immediate shelter — over 500,000 homes and cultural sites across Nepal were destroyed or damaged as a result of the earthquakes. "The monsoon rains have already started and these people need shelter," Murray tells Bustle. "The tents are not good enough for monsoons — they get muddy and can't hold off the wind. We want to build as many as we can, but at least a thousand homes for people whose homes have been destroyed." The NYF plans on providing the materials and training for the new homes; which will end up costing an estimated thousand dollars per home. The prefabricated walls will be imported from Thailand while the steel will be manufactured in Nepal. But you cannot build during a monsoon. For now all they can do is provide sheet roofing, so far to 527 families, and raise the walls once the rains are over. Up to 80 percent of the yearly rainfall will pour down during Nepal's monsoon season, exacerbating the dangers already present in the region. "Hospitals are overflowing, water is scarce, bodies are still buried under the rubble, and people are still sleeping in the open," UNICEF's deputy executive Rownak Khan says in a statement. "This is the perfect breeding ground for disease." When people are living outdoors, the risk of contracting diseases like measles, diarrhea, and respiratory illnesses grows immensely. Even cholera, which can kill within hours if untreated, bears risk of higher rates of contraction. "A major issue is that the monsoon season is likely to cause an increase in water-born illnesses such as cholera, which was already a problem in Nepal before the disaster," says Chaggar. "Cases typically surge in the monsoon season anyway and this is likely to be worse in the aftermath of the earthquakes as sanitation facilities and water supplies have been damaged." In an effort to alleviate the hygiene risks that may emerge, the International Medical Corps has constructed 660 emergency latrines and distributed 1,026 household hygiene kits to families since the first earthquake. But while international aid efforts mitigate the situation, the financial destitution of many communities heightens the risk of these diseases, virtually nonexistent in industrialized countries. Dr. Binay Shah, founder and president of the Binaytara Foundation which is currently establishing Nepal's first bone marrow transplant center and first out-patient hospice program, believes the most pressing issue in Nepal can be summarized in one word: poverty. "The recent disaster's toll on public healthcare cannot be ignored. People lack access to proper healthcare," Shah tells Bustle by email. "More than a quarter of the country's GDP comes from remittance — the income sent home by migrant workers in the Middle East. A large number of highly educated professionals have migrated to developed countries like the U.S., U.K., Australia and other western countries. The government and pretty much every other sector is corrupt." A group of international public health experts have called for the Nepalese Ministry of Health to step up in the protection of the nation against hepatitis E (HEV), which they fear may erupt in a massive outbreak. In a document published in the medical journal Lancet the experts write that 500 pregnant women could die from the virus in the coming months; pregnant women have a mortality rate of 25 percent from the virus. "Earthquake-affected areas are faced with the 'perfect storm' of risk factors: large displaced populations with limited access to clean drinking water, lack of sanitary facilities, the approaching monsoon, overburdened health-care infrastructure, large amounts of circulating HEV, and an at-risk population that mostly lacks protective antibodies," the researchers write. China is currently the only country that has a licensed safe and effective vaccine for HEV, but the World Health Organization said that it's use should be considered in disaster situations such as this. In order to help high-risk communities the researchers make the case for the Nepalese government to request the vaccine, build a stockpile, and determine how to deploy and monitor it. The Nepali government believes it will take five years to rebuild the country, which will end up costing more than $6.6 billion. The government itself will provide $200 million, and while the U.N. appealed for $423 million to cover emergency sections, in May only 22 percent of that had been funded. But while the international community has risen to the occasion during these times of disaster, those working closely with the community like Dr. Binay Shah believe there are numerous internal struggles that the people of Nepal face in these recovery efforts. But while the rains and winds of the monsoons cover Nepal and the focus of long-term construction switches to the immediacy of shelter and health, the Nepalese have little option but to continue to do what they have from the beginning: comforting loved ones, sharing with survivors; saving what they can from the rubble. "Losing a loved one is devastating. Losing the entire family and everything you ever owned, loved, cherished, is beyond words," says Shah. "This is what many of these earthquake survivors have been dealing with. But resilience is what describes these people's nature."